How to browse the web 8 times faster using Opera Browser? 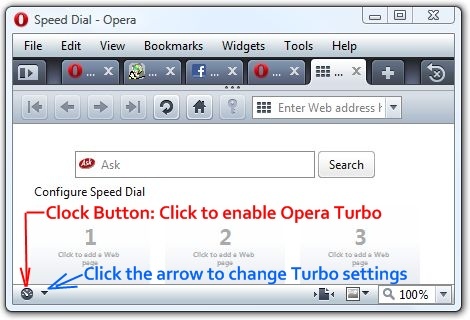 The new Opera 10 browser has a feature called the Opera Turbo. So if you are on a slow network or a not so reliable wi-fi, Opera Turbo will give you the much required browsing boost. In this article we will tell you more about this new technology from Opera and how you can use it to browse the web 8 times faster than your regular Internet connection. Opera Turbo is an advanced compression technology from Opera that helps with two things: speed up data transfer and reduce the amount of data to be downloaded. If you start experiencing low Internet speeds then you just need to turn on Opera Turbo that instantly compresses pages on Opera's servers and then the compressed webpage is sent to you, so that less amount of data needs to be transferred. This ensures faster loading of web pages even on a slow Internet connection. 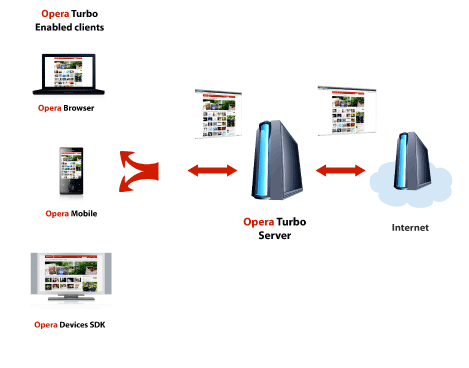 A press release from Opera states that Opera Turbo gives up to eight times faster Web surfing over slow connections than other browsers. How to enable Opera Turbo on your computer? 1. You have to download and Install Opera Browser on your system. Goto the Download page and choose the version that suits your Operating System. 2. Now start the Opera Browser. Once it is up, you can see a "clock" icon at the bottom-left of the windows of the Opera Browser. This "Clock" icon is the Opera Turbo button. 3. In order to start the Turbo mode in Opera, all you need to do is just click on the "Clock" icon. When Turbo Mode is ON the background of the icon turns green. 4. You can also change settings for Opera Turbo by clicking on the Arrow Button next to the "Clock" icon. 5. Now you can enjoy high speed browsing even on a slow Internet connection using Opera Turbo.